The remarkable sporting journey of Trinity School student Jessica White was recognised at the prestigious Jack Petchey Foundation Outstanding Achievement awards at the Olympic Park. 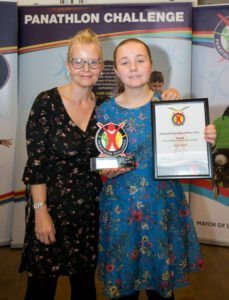 Jessica, 17, won the Excellence in Sport and Leadership Award at John Lewis Stratford City in our 10th annual ceremony, which saw Panathlon reward their top achievers of the year across London and Essex. Jessica, from Romford, started at Trinity School in Dagenham in September 2006 with no speech and unable to take part in activities independently. She went on to overcome her communication problems and became a leading student who was named the school’s Head Girl this year. Sport played a key role Jessica’s transformation and she has nurtured a keen interest in the sport of boccia, developing game-specific skills and leadership qualities that have brought success to the school. She has represented Trinity at several Panathlon boccia competitions and performed superbly, helping her team to a series of victories. Jessica is also a TEACCH (Treatment and Education of Autistic and related Communication Handicapped Children) Trainer, assisting school staff in the use of structured teaching methods, and is a member of extra-curricular dance, badminton and Panathlon clubs. Jessica has been part of the Panathlon team representing Barking & Dagenham that has won our showpiece London Multisport Final at the Copper Box Arena for the last three years in a row. The prizes at the ceremony were presented by Panathlon Ambassador and Paralympic gold medallist Liz Johnson, Gemma Juma from the Jack Petchey Foundation and special guest Matthew Key, a top Panathlon competitor from Enfield. At the ceremony, it was announced that the Jack Petchey Foundation, Panathlon’s longest-serving supporter, would be donating £123,465 to provide sporting opportunities for disabled young people in London and Essex in 2018/19, bringing its total donations to Panathlon to almost £1million over the last 14 years.